Push user-facing notifications to the user's device from a server, or generate them locally from your app. User-facing notifications communicate important information to users of your app, regardless of whether your app is running on the user's device. For example, a sports app can let the user know when their favorite team scores. Notifications can also tell your app to download information and update its interface. Notifications can display an alert, play a sound, or badge the app's icon. You can generate notifications locally from your app or remotely from a server that you manage. 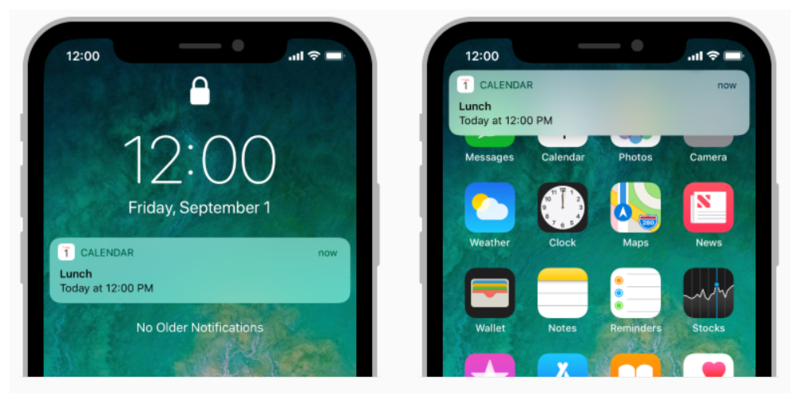 For local notifications, the app creates the notification content and specifies a condition, like a time or location, that triggers the delivery of the notification. For remote notifications (also known as push notifications), you use one of your company's servers to generate notifications, and Apple Push Notification service (APNs) handles the delivery of those notifications to the user's devices. Define the types of notifications that your app supports. Define any custom actions associated with your notification types. Schedule local notifications for delivery. Every attempt is made to deliver local and remote notifications in a timely manner, but delivery isn't guaranteed. The PushKit framework offers a more timely delivery mechanism for specific types of notifications, such as those used for VoIP and watchOS complications. For more information, see PushKit. Ask the user's permission to display alerts, play sounds, or badge the app’s icon in response to a notification. The central object for managing notification-related activities for your app or app extension. The interface for handling incoming notifications and notification-related actions. The object for managing notification-related settings and the authorization status of your app. Generate notifications from your company's servers, and deliver those notifications using APNs. Set up a server to generate notifications and push them to user devices. Communicate with APNs and receive a unique device token that identifies your app. Create delivery requests for local notifications, and access the content of delivered local and remote notifications. Create and schedule notifications from your app when you want to get the user's attention. A request to schedule a local notification, which includes the content of the notification and the trigger conditions for delivery. The data for a local or remote notification that was delivered to your app. Modify and examine the payload of a notification. The editable content for a notification. The uneditable content of a notification. A media file associated with a notification. The sound played when a notification is delivered. A string providing the name of a sound file. Define the trigger conditions for delivering notifications. Detect when a remote notification was delivered from APNs. A trigger condition that causes a notification to be delivered at a specific date and time. A trigger condition that causes a notification to be delivered after the specified amount of time elapses. A trigger condition that causes a notification to be delivered when the user's device enters or exits the specified geographic region. A trigger condition that indicates the notification was sent from Apple Push Notification Service (APNs). The common behavior for subclasses that trigger the delivery of a local or remote notification. Define the types of notifications that your app supports, and define how users can respond. Differentiate your notifications and add action buttons to the notification interface. A type of notification that your app supports and the custom actions to display with it. A task to perform in response to a delivered notification. An action that can accept user-typed text. Respond to user interactions with the system’s notification interfaces, including handling your app's custom actions. The user’s response to an actionable notification. The user’s response to an actionable notification, including any custom text that the user typed or dictated. Use a notification service app extension to modify the content of a notification before it's delivered to your app. Modify the payload of a remote notification before it's displayed on the user’s iOS device. An object that modifies the content of a remote notification before it's delivered to the user. The environment for push notifications. The environment for push notifications in macOS apps.